Researchers looked at the link between SM and head shape in certain breeds. New research by the University of Bristol's School of Veterinary Sciences, shows selective breeding may be the way forward to reducing the incidence of syringomyelia (SM) - a painful condition that can lead to paralysis - in the Cavalier King Charles spaniel and other toy breeds. SM - also known as "neck scratcher's disease", as one of the common signs is scratching in the air near the neck - sees fluid-filled cavities develop within the spinal cord near the brain. 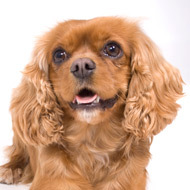 The study looked at the incidence of the condition in Cavalier King Charles spaniels and its link to head shape in certain dog breeds, and identified two significant risk factors - the extent of brachycephaly and the distribution of doming of the cranium. The research found that brachycephaly is associated with a malformation of the skull, known as Chiari-like malformation (CM), and concluded that the results of the study, in combination with the British Veterinary Association/Kennel Club scoring scheme, may allow for selection against risk aspects of conformation to enable a reduction in the incidence of CM and SM. The complete research paper has been published in BioMed Central's Canine Genetics and Epidemiology journal and can be viewed at www.cgejournal.org/content/1/1/9/abstract. Undergraduate student Thomas Mitchell, lead author of the study, said: "Dog breeders are very experienced at selecting for a certain conformation or appearance in dogs. "Our findings may allow breeders to select away from the condition over fewer generations by choosing appropriate matings and offspring to continue breeding programmes. The identification of an appearance that might protect against developing the disease is a significant step forward in tackling this painful condition. "The study also provides guidance to breed clubs, breeders and judges that have a responsibility to avoid obvious conditions or exaggerations which would be harmful in any way to the health, welfare or soundness of the breed. It will also provide vets with verified advice to provide to breeders outside the show ring and to occasional hobbyists." Aimée Llewellyn, health information manager at the Kennel Club, who funded the study, said: “The findings of this research are very interesting and will likely prove invaluable for breeders who wish to make sensible and informed choices when it comes to breeding healthy puppies."